The debate of physical books vs ebooks still rages among readers. Every week or so, I come across a post on social media asking followers which camp they fall in. Particularly on Instagram, which is the most visual platform I use, hardcover books reign supreme. They look nice and photograph well. There are entire #bibliophile accounts where people post tons of creative pictures of their book collection. I would love to do this as well, but I don’t actually have physical copies of most of the awesome fiction books I’ve read. After several moves across the country, I was forced to pare down my book collection. I’ve been amassing more, but I refuse to have books on my shelf that I haven’t read, and I do most of my reading on Kindle. That means that there are quite a few duplicates between my physical and digital book collections. The launch of the first iPhone was exciting all around, but one of the coolest features was this new app called iBooks. Naturally, I thought it was dumb at the time—paperback books worked just fine and phones were for making calls and sending text messages. I downloaded the demo, Alice in Wonderland, and it was okay. But then when I found a book I actually wanted to read, which was cheaper on iBooks, I decided to give it a real go. It also helped that I wanted to read the Southern Vampire Mysteries without my coworkers knowing. That was the big turning point. Having a book on my phone, a device which I already brought with me all the time, was incredibly convenient. I could read during my lunch breaks, while waiting in line, and in total darkness. When the Kindle came out, I thought it was cool, but also prohibitively expensive. Plus, I already had a great solution reading on my phone. Then one year for Christmas, I got a Kindle Paperwhite. They were finally more affordable, so I hinted to my husband I might want one. Unsure what to read, I downloaded every Sherlock Holmes story and read them all. I loved that I could easily switch between reading on my phone, iPad, and the Kindle, and all devices would sync up to my latest-read point. It was perfect for taking bunches of books on trips, but also convenient to leave at home so I could prevent losing it while out and about. This is also when I started doing the majority of my reading at bedtime because it had the built-in light (also because of kids—it’s just easier to read after their asleep). Obviously, my Kindle and I were a match made in heaven. It’s the one electronic my children haven’t destroyed (yet) and which hasn’t fallen apart after only two years. 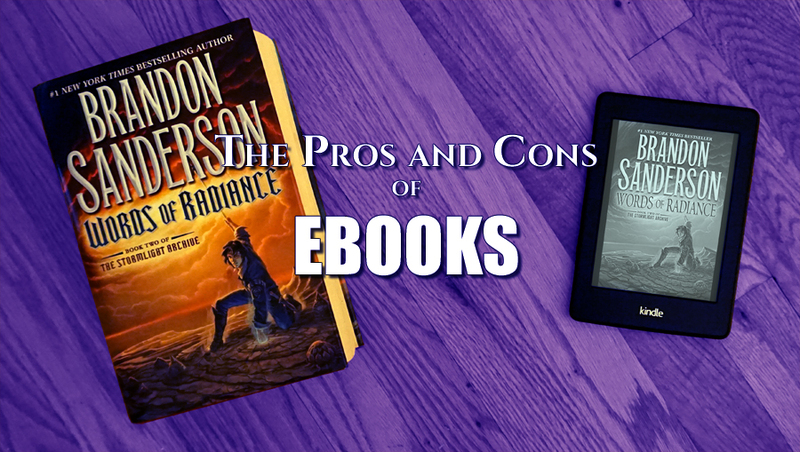 Although I’m incredibly fond of ebooks and the range of devices they can be read on, I will readily admit that there are some pretty big cons as well. For some reason, traditional publishers have decided that ebooks should be more expensive than their physical counterparts. It doesn’t make sense since the cost of making and distributing ebooks is so small. When people point out that ebook sales are dropping, it’s because the big five publishers have reported that ebook sales are dropping—likely because their prices keep rising. In reality, ebook sales are booming, it’s just hard to get data from every small publisher and self-published author. There are ways to loan an ebook you’ve purchased to someone, but overall, they aren’t transferable like physical books. This proved particularly frustrating when checking out an ebook from my library (basically, I needed special software which only worked on a computer, completely taking away the convenience of reading the ebook version). They also can’t be resold or donated after you finish them. This is actually the biggest one for me. I’ve been focusing my social media work on Instagram (read this post to learn my Instagram strategies) which is almost entirely visual. Physical books look nice in photos, but how do you photograph an ebook? A cover just plopped on top of a stock photo. The cover is looking a little blue. Where'd the beautiful colors go? I’ve seen two strategies so far for pictures of ebooks: 1. Plop an image of the cover over another picture and 2. take a picture of the ebook on a device. The first way isn’t particularly pretty or professional. For the second, taking a picture of a phone, tablet, or computer screen turns out incredibly blue, while pictures of ereaders will show the cover in black and white. Now I understand why commercials and ads always have the disclaimer “screen images are simulated.” My workaround includes a lot of Photoshop which isn’t a great solution for most readers. However, for every con, there is a pro, and since I’m an ebook lover, I have to leave you with the good side! Ignoring the big five publishers, ebooks can be incredibly affordable. Since they’re cheaper to produce, small publishers and indie authors can reflect this in their prices. It’s much more cost effective to read lots of great indie ebooks than to purchase a bunch of traditional paperbacks. Unlike physical books which can be misplaced, lost, or destroyed, ebooks exist in the cloud. Even when they’re not currently on any of your devices, they still live in your account and can be downloaded onto any new ereader you receive. Although I’m not one to reread any book over and over, some people do, which makes an indestructible ebook really appealing. I’m not the only avid reader with the problem of insufficient shelf space for my book collection, and if I acquire physical books at the rate that I read them, my place would quickly become more book storage than home. Although I could get rid of some of my books, must have the precious.